Spinach Artichoke Mashed Potatoes is one of the BEST mashed potato recipes you will ever taste! No kidding. 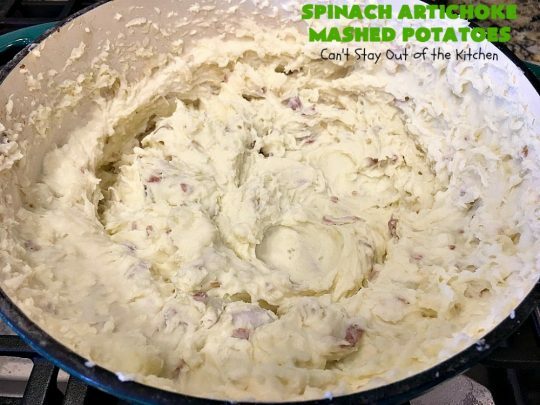 Mashed potatoes are mixed with cream cheese, sour cream, and butter, then seasoned with salt, pepper, dill weed and roasted garlic. 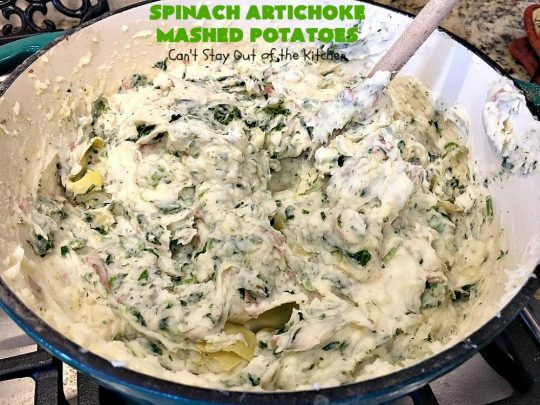 After that, spinach and artichokes are stirred into the potatoes making for a rather spectacular explosion of flavors. On top of this, the potatoes are quite healthy, too. Not so shabby! This wonderful side dish is not difficult to whip up either. 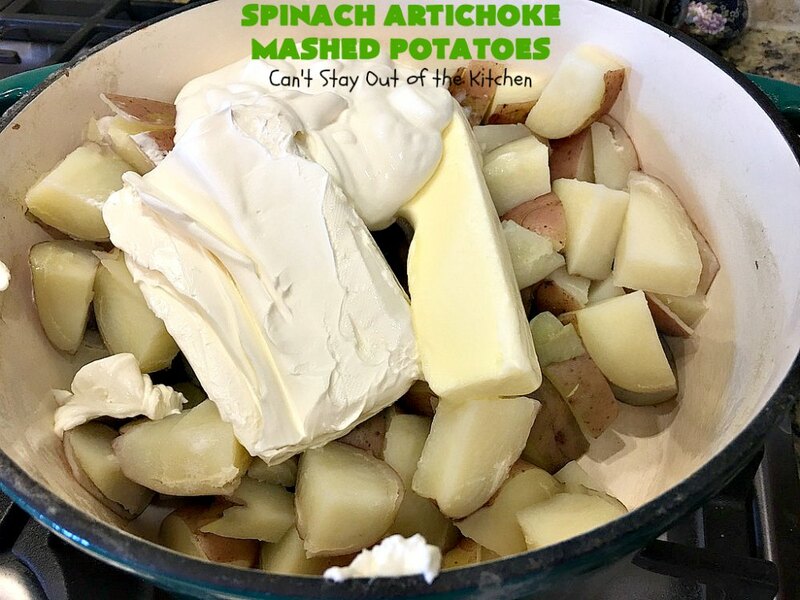 I served these super-duper tasty potatoes as a side dish with Paula Deen’s Bacon Cheeseburger Meatloaf a couple of weeks ago when we had company over for dinner. Not only did they rave over the meatloaf, but everyone enjoyed these potatoes too–even the kids. Seriously. 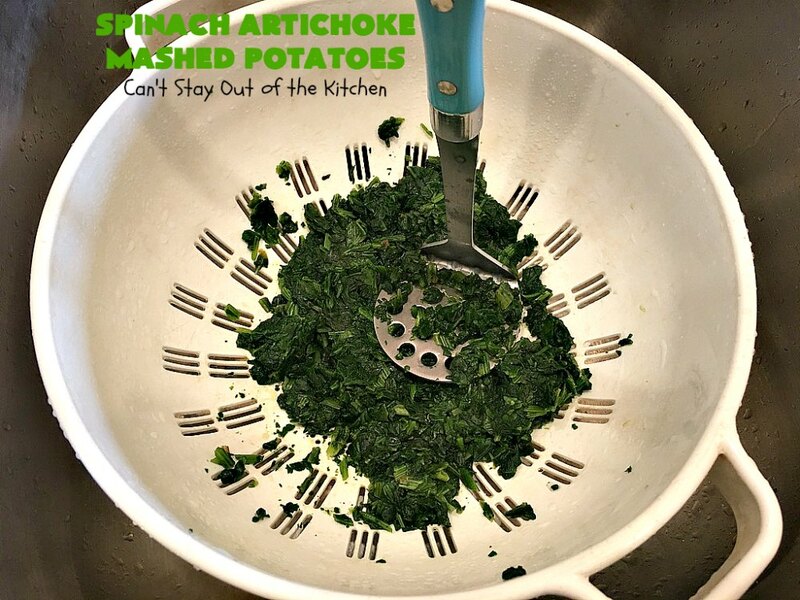 The kids ate mashed potatoes with spinach and artichokes in them–gobbled them up in fact! Can you believe it? I had two servings. Gulp! Yeah, I really did. I have loved Spinach Artichoke Mashed Potatoes ever since I first sampled them. It was at a huge potluck our church in Cedar Hill had probably about eight years ago. There were 500+ people there with all kinds of homemade casseroles, meats, desserts, breads, salads–you name it, there was food there for an army. I was fortunate enough to obtain a sample of these potatoes and liked them so much I had to hunt down the person who brought them. To my surprise it was someone in our Sunday school class who was very glad to oblige me with the recipe. When Brooke gave me the recipe she told me that the original recipe only had spinach in it, but she liked artichokes so she always added them. I’ve made this recipe with mushrooms, and onions too, although, I like this version the best. Back in 2006 I went through my whole recipe collection and put everything on computer. Originally, I was trying to do this for my children (and their spouses). But there was a gal at church who was practically in tears over not being able to cook well, while her husband could whip up anything without a recipe. I told her I would put together a cookbook for her of tried and true recipes that weren’t too difficult so she would have some guidance in getting started. I tried to go through my recipes and make them more easy to understand for the novice cook. If you’re looking for a different way to make mashed potatoes, then I urge you to give this recipe a try sometime. 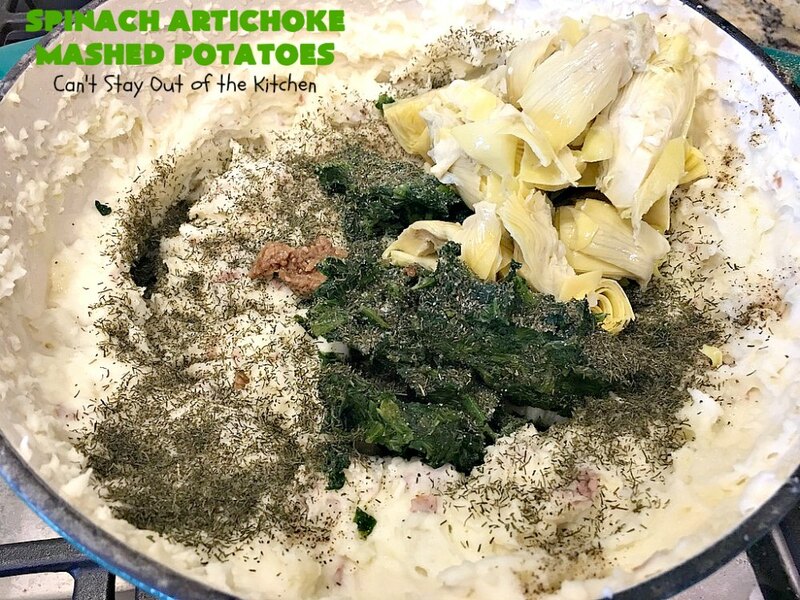 The original recipe from Brooke notes that you should purchase artichokes that are not marinated, although I’ve tried this recipe both ways and thought it turned out well either way. Just saying. Spinach Artichoke Mashed Potatoes is such a good recipe you will find yourself making it often for company or even just for your own family because it tastes so delicious. I’m ready for another bowl right now. Bring it on! When I posted this recipe in October 2013, I was still fairly new to taking pictures with my Canon. The pictures were okay, but nothing to write home about. I recently remade the recipe (August 2018) and served it with Oven BBQ Chicken and Biscuits and Magic Cherry Cobbler. Everyone loved these potatoes – even some of the picky eaters. 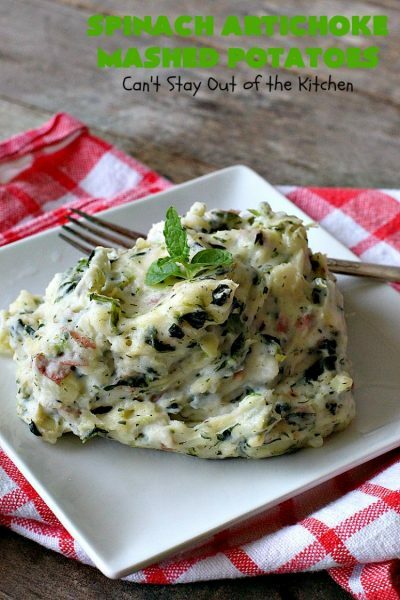 Spinach Artichoke Mashed Potatoes is an incredibly delectable side dish. The additions of spinach, artichokes, roasted garlic and dill weed make this a very memorable casserole. The savory flavors are fantastic. 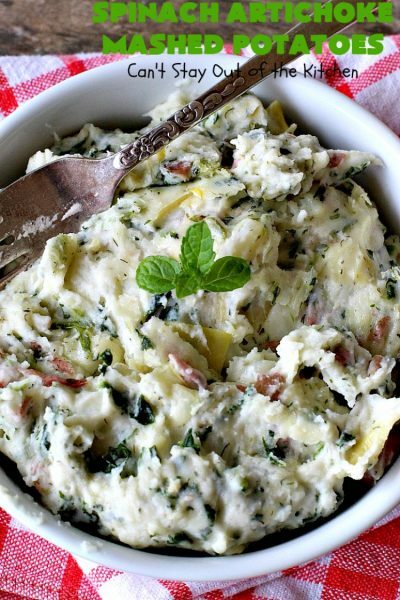 These potatoes are made extra creamy by the additions of cream cheese and sour cream. I served them with Oven BBQ Chicken and Biscuits. Yum. Cook spinach in the microwave about 5 minutes. 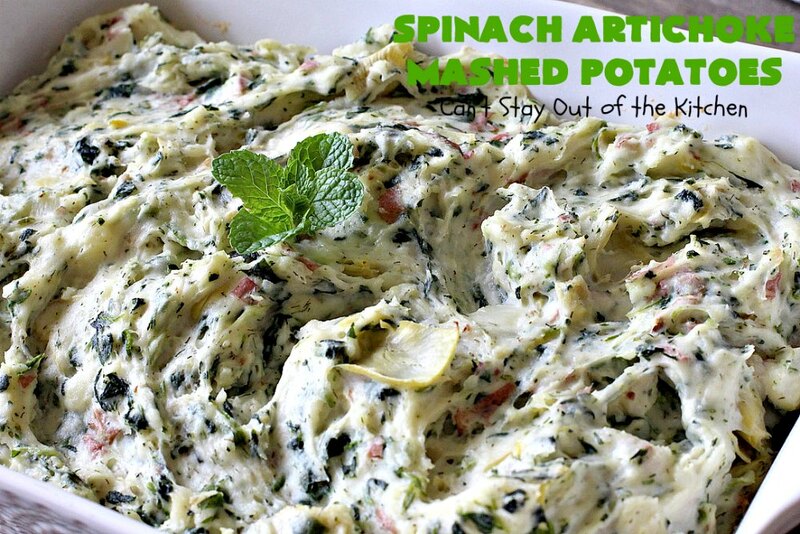 Remove spinach from container and allow to cool a few minutes in a drainer. Press out as much water as you possibly can. I actually had to pick the spinach up in my hands and squeeze out the excess water because I couldn’t get it all out any other way. You don’t want soupy mashed potatoes, so squeeze, squeeze, SQUEEZE!!! Boil potatoes and drain. I used unpeeled red potatoes to make the recipe. Place boiled potatoes in a large mixing bowl. Add butter, sour cream and cream cheese. Cream with an electric mixer until ingredients are smooth. Add seasonings, roasted garlic, well-drained artichoke hearts and well-drained spinach. Spray a 9×13″ glass baking dish with cooking spray. 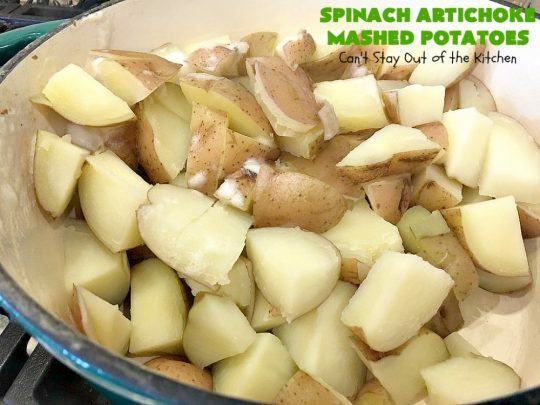 Pile mashed potatoes into baking dish. Bake at 375 for 20 minutes. Serve as a side dish for almost any kind of meat. The texture of the Spinach Artichoke Mashed Potatoes is delightful. Granted, I LOVE mashed potatoes, but this casserole really works. Spinach Artichoke Mashed Potatoes is a great side dish paired with Oven BBQ Chicken and Biscuits. 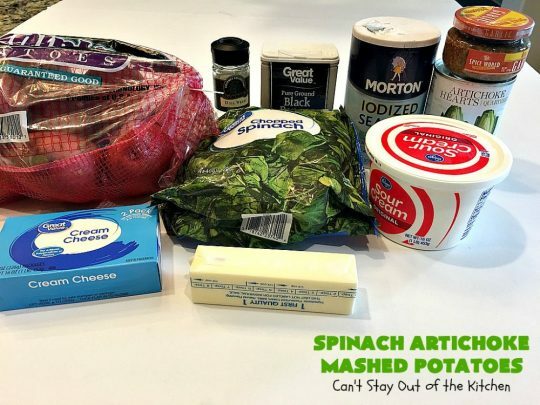 This spectacular mashed potatoes casserole is filled with spinach, artichokes and roasted garlic. It's made creamy by adding cream cheese and sour cream. 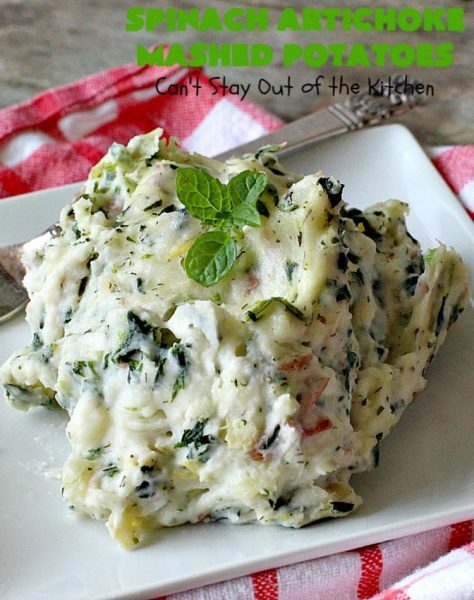 It's a delightful side dish that's wonderful for company or holidays like Thanksgiving or Christmas. Gluten free. Wash and chunk potatoes and bring to a boil. Spray a 9x13” casserole dish with cooking spray. Whip potatoes, cream cheese, sour cream, and butter with an electric mixer until smooth. Spoon into the prepared casserole dish and bake at 375° for 20 minutes. NOTE: I have used marinated artichokes and they work fine, as well. Be sure to rinse them several times before adding to the recipe. NOTE: I have also prepared this recipe up to the point of baking and refrigerated it several hours before baking. Bake at 375° until heated through – about an hour or so. NOTE: Or, you can substitute about 4 pounds of large red potatoes, unpeeled and cooked, well drained. NOTE: Be sure to squeeze out all of the excess moisture from the spinach before adding to the recipe. Otherwise, you will end up with soupy mashed potatoes. 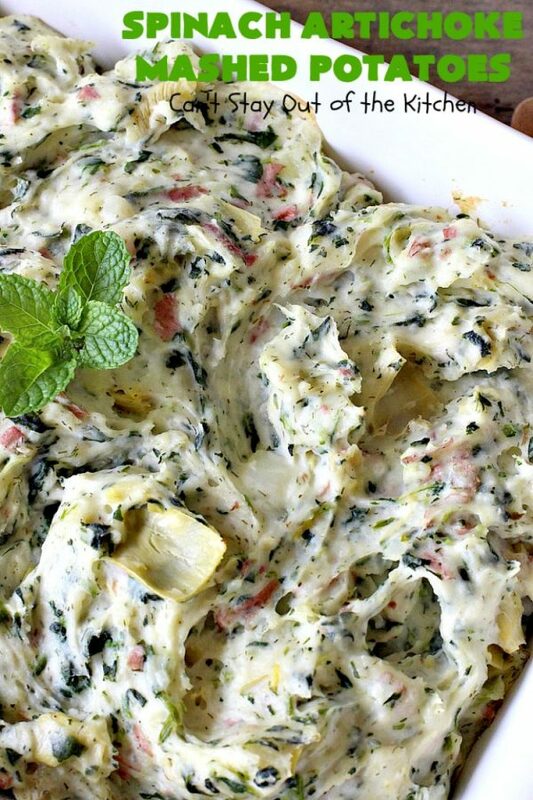 This lovely casserole is made with mashed potatoes, cream cheese, sour cream, and butter, then seasoned with salt, pepper, dill weed, roasted garlic. Spinach and artichokes are added to the mixture before baking. Absolutely wonderful concoction. Spray a 9×13” casserole dish with cooking spray. Whip potatoes, cream cheese, sour cream, and butter until smooth. I have used marinated artichokes and they work fine, as well. [br][br]I have also prepared this recipe up to the point of baking and refrigerated it several hours before baking. Bake at 375° until heated through – about an hour or so. Spinach Artichoke Mashed Potatoes are mouthwatering. When the kids rave about a dish you know it’s good! I paired the potatoes with Paula Deen’s Bacon Cheeseburger Meatloaf the first time I made it. 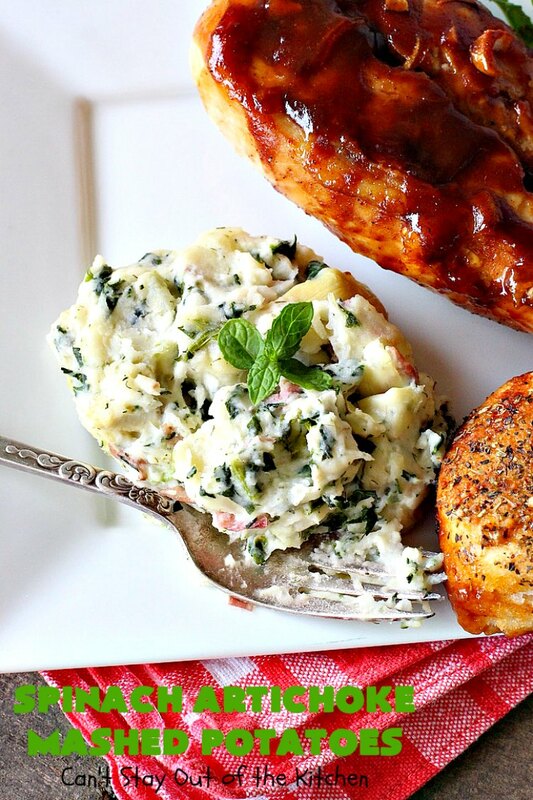 The second time I paired the potatoes with Oven BBQ Chicken and Biscuits. Both times the pairing of the two dishes was yummy! 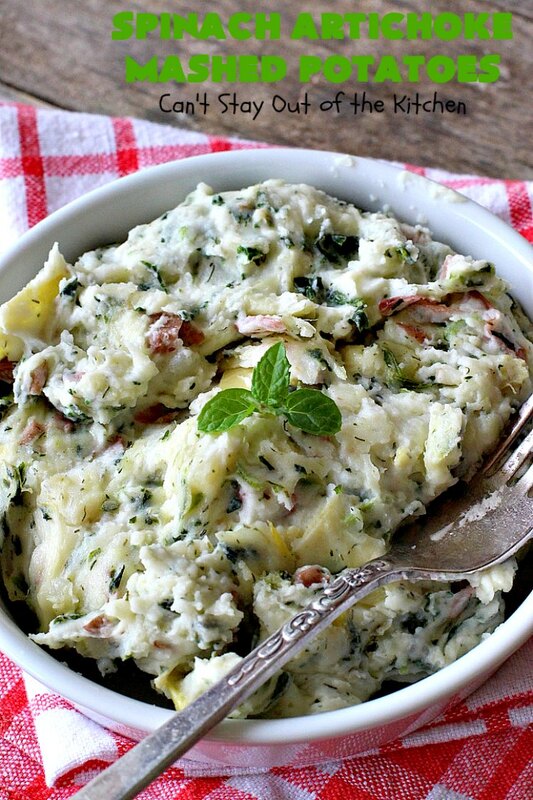 Every forkful of these Spinach Artichoke Mashed Potatoes is succulent and amazing. Yum! 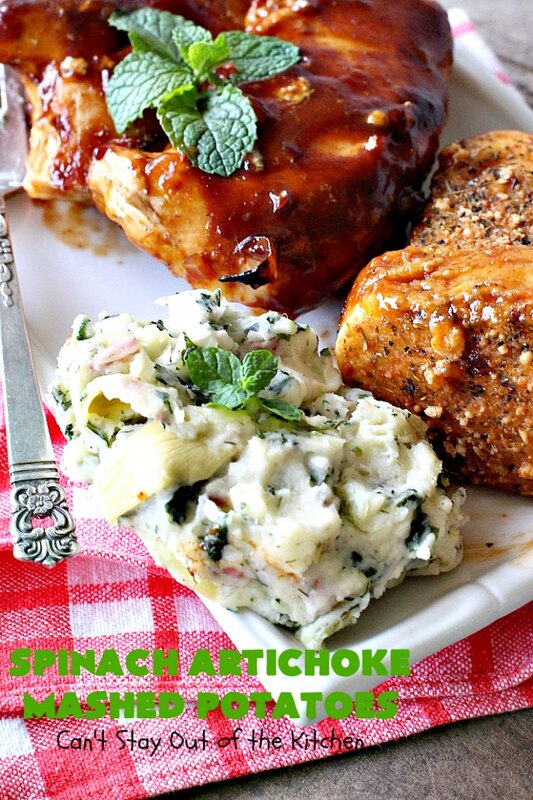 These sound great–I love spinach artichoke dip, so I would love these!